As a young therapist, I learned from my first mentor that Self-Esteem is a combination of believing you are loved and believing you are good at something. A decade and a half later, I have many more thoughts about the topic. What I have noticed is that the “academic” definitions therapists give their clients are often offered without explanation. But I have found that real-world examples provide the best illustrations of concepts like self-esteem. With this post, I want to provide a story from my daughter’s life when she was 7 years old. The example exaggerates the choices I had as a parent who was concerned about my child’s growth. It also identifies how self-esteem develops. Please enjoy . . .
She watched, barely breathing, as a rodeo cowboy carefully lowered himself down to a seated position atop an angry bull. The bull, corralled into a small space that forced him to remain still enough to be mounted against his will, was required to submit only so long as the iron gate leading to the open arena was closed. But, as soon as the gate latch was kicked open, the bull raged in fury as it bucked, twisted, kicked and fought until the cowboy was thrown, as a rag doll, to the ground. When that cowboy was thrown off, my child still refused to come to dinner. She watched again, with increasing interest, as each man who attempted to conquer the bull was mercilessly thrust to the ground. I stood, watching; pulled in by the same scene that mesmerized my daughter. In my mind, I was wondering what a man would have to be thinking to do such a thing. I watched as arms were twisted beyond their natural positions and body parts were nearly crushed. 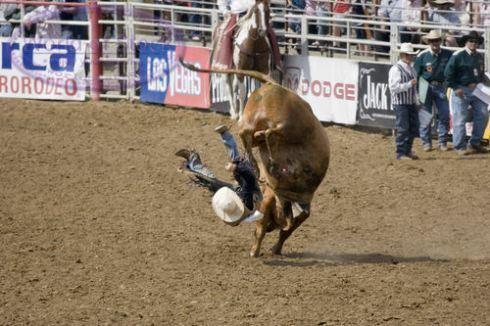 Once thrust to the ground, panic ensued as the man was rescued from the ground before he was crushed by the furious bull. It was a life-or-death struggle; yet these men rode angry bulls for sport. Surely, they knew that each time they mounted the bull, the episode would end in defeat! Yet they continued. I stood clueless about what drew them to the sport. Yet, like my daughter, what I saw in each cowboy’s efforts enthralled me. Next, I have visions of my 7-year-old child, a fixed expression of determination on her face, as she mounts an angry bull with the same kind of do-or-die expression as I see in her eyes at this moment, proclaiming victory over a bull she has never encountered, except in her imagination. The next picture in my head is of her broken body, since I know (in my “adult wisdom”) that her 58-pound frame would be instantaneously evaporated in a contest with a 2000-pound angry monster-of-a-bull. That image is much more than I can bear, so I dismiss her statement of victory over bull riding and say something to her about how much she would get hurt. With that casual statement, I hope to distract her from the bull riding. After all, it is my job to teach my child about what is possible and what isn’t . . . . But . . . my child does not forget! For days, she talks about riding a bull. She goes to school and tells her friends: “I can ride a bull!” She comes home and says the same thing. She is oblivious to the realities of physics and social sanctions. In my desire to protect her, I am oblivious to her truth. When she watched the rodeo, she felt strong, courageous, confident, invincible. When I watched, I felt confused, afraid and incredulous. With her attitude, my child could, doubtless, mount any real or imagined “bull” she encountered in her life fearlessly and with confidence. My fears and concerns for her safety would teach her caution and trepidation. In her vision of bull riding, my daughter is taking her free, strong spirit on a journey that makes everything possible. In my concern about physics and social appropriateness, I stunt the growth of her imagination. However, I’m the parent, right? I know better because of my knowledge and experience. It is my job to “teach” her about what is safe, correct and reasonable. This is a defining moment and I define a reality that strengthens my child against danger. But will my unenthusiastic response to her proclaimed victory over bulls lead to the “I can’ts” she will grapple with in her future? Do I want to be responsible for teaching my child to see limitations instead of seeing possibilities? This example provides a perfect illustration of a concept we therapist-types call “Projection.” In my fear, I “knew” that she could never ride a bull. It was my fear speaking and from fear I spoke to her. I taught her on two levels: on the intellectual level with my statement that she would get hurt and on the emotional level with my fear. In that subtle communication between parent and child that we so often ignore, my fear was communicated to my child in subtle ways with the message: difficult tasks are too painful to try. I am not ashamed to say that I haven’t always been a perfect parent. Had I seen that moment as an opportunity to build her self-esteem, I would have indulged her fantasy and said something like: “That’s right! You CAN ride a bull and you would NEVER fall off!” I’m certain her childhood fantasy would have faded, but an affirmative “You Can Do It!” response would have stayed with her. I would have been verbally telling her she can do difficult things while emotionally instilling confidence. The subtle attitudes communicated to us as children in our families of origin lay the foundations for our beliefs about ourselves. Unless we learn to examine those assumptions, its possible that we can continue to sabotage ourselves as adults without ever realizing what is happening. This is because “truths” which are projected to us via emotional communication during childhood are accepted as objective truths. When, in fact, they are simply false beliefs made to feel true because of the emotions associated with the original messages. The same is true when we come under the influence of an abuser who sets out to instill “truths” in us that are, in fact, malicious lies. It has been nearly two decades since I first heard self-esteem conceptualized as a combination of being loved and feeling competent. I agree with the equation but cannot ignore the nuances. Building self-esteem for a child is a matter of the child being taught they are loveable and building their sense of competence. Being loveable means that the child develops an internal “knowing” and confidence in herself as a loveable person. The child must learn a healthy balance between giving of herself and caring for herself enough to set appropriate limits in relationship. Rebuilding self-esteem for an adult woman involves the exploration of her beliefs which limit her in order to identify the limiting beliefs, neutralize the traumatizing negative emotions and replace the limiting beliefs with affirming, growth producing alternatives. In the real world this means finding a healthy balance between self and other. Never giving more than you have to give and having the freedom within to distinguish between choosing to give of yourself and feeling compelled to do so. Fortunately, it is never too late to begin. Click here to learn Tamara’s solutions for dealing with feelings. ← Big news for 2bSisters!! !